Maize (Zea mays L.) is host for more than 50 virus species worldwide with Maize streak virus (MSV) (genus Mastrevirus) causing significant yield losses in Africa. A survey for viruses infecting maize was conducted in major growing regions of Ethiopia. To test for DNA viruses, in particular mastreviruses, rolling circle amplification was performed for the analysis of virus composition in assayed samples. 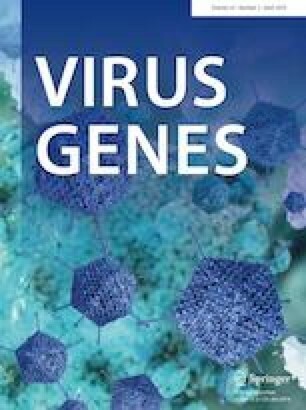 Following the analysis of the entire virus genomes, three genetic groups, each representing distinct virus species, were identified. The first group was almost identical with the A-strain of MSV. The next sequence-cluster shared 96–98% identity with isolates of Maize streak reunion virus (MSRV) confirming the presence of this virus also in continental East Africa. Sequence analysis of additional virus genomes (each 2846 nt) in length revealed only a limited 70–71% nt identity with MSRV isolates and an even lower identity (< 64%) with sequences of mastreviruses described elsewhere. Our analysis suggests a novel virus species, which is tentatively named maize streak dwarfing virus (MSDV). The pairwise comparison of capsid protein and replication-associated protein (Rep) of the novel species revealed a limited identity of 63% and 68% with the respective protein sequences of MSRV. The incidence of the virus species in the maize regions of Ethiopia was studied across 89 samples collected during four growing seasons. PCR analysis with general and specific mastrevirus primers showed that MSV is the most incident virus (39.3%) followed by MSRV (14.6%) and MSDV (12.4%). Identification of three different mastrevirus species in a confined geographical location on the same host, maize, is unprecedented, and suggests that Ethiopia may be one of the potential hot spots for diversity of maize-infecting mastreviruses. Communicated by Dr. Karel Petrzik. The original version of this article was revised: In “Detection and reconstruction of mastreviruses genomes” subsection, the nucleotide position for C and G and in “Distribution and incidence of mastreviruses infecting maize in Ethiopia” subsection, the month in which the sample was collected have been corrected. The online version of this article ( https://doi.org/10.1007/s11262-019-01655-1) contains supplementary material, which is available to authorized users. A correction to this article is available online at https://doi.org/10.1007/s11262-019-01662-2. This research was partly supported by funds from the Ethiopian Ministry of Innovation and Technology (formerly Ministry of Science and Technology), the German Academic Exchange Service (DAAD) In-country/In-region scholarship program, and the Addis Ababa University. DG, AA, KT, SW, and DK conceived and designed the study. DG, AA, and KT collected the samples. DG and DK carried out the experiments. DG and DK performed the data analysis. DG wrote the first draft. AA, KT, SW, and DK reviewed and edited the manuscript. All the authors read and approved the final manuscript. All authors (D. Guadie, K. Tesfaye, D. Knierim, S. Winter, A. Abraham) declare that they have no conflict of interest.